Spiders – Ugh! They’re creepy, crawly, and certainly not welcome inside your home. Spiders are on the move this fall and often wander indoors to keep warm throughout the cold winter months or to look for a meal. 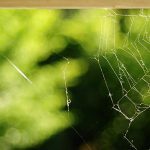 Learn how to keep fall spiders outside, where they belong with these helpful tips and how-tos below. Why are spiders more often seen in fall? In spring and summer garden spiders are smaller and less able to defend themselves from predators. So they hide under fallen leaves, or in tall grass. By fall, they are full size, braver and easier to see. Also, autumn is mating season so they may be out roaming for a mate. What kinds of spiders are commonly seen in autumn? Often referred to as the common grass spider, the Funnel Weaver Spider is seen often in late summer and fall. This species has an oval-shaped body with two brown stripes running vertically up the sides. Harmless to humans, the funnel weaver spider will build a dense web in a far corner if left alone. The Yellow Sac Spider is a nightcrawler. Pale in color, this species spends the daylight hours inside a spun sleep sac, usually built where the wall meets the ceiling. This arachnid is more active at night, venturing out to find insects. The yellow sac spider is identified by a pale beige to yellow body, and legs tipped in black. Bites are uncommon, but if a human accidentally invades their space, they may bite in defense. A bite from a yellow sac spider is painful and can result in redness and mild swelling. The Banded Garden Spider builds a symmetrical wheel-shaped web, usually on garden shrubs. They are often seen in late summer and early fall. The female Banded Garden Spider is large and brightly colored. It is harmless to humans and tends to hide during the day becoming active at night. Why are spiders attracted to my home? Spiders like to stay warm, so when cooler temperatures arrive, they seek the warmth of your home. 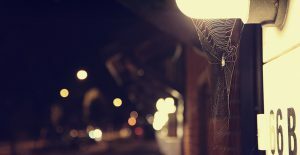 A house, garage or other indoor space is the perfect place for spiders to hide out in the colder months. Or they may wander inside an open door or window looking for a meal. A spider’s diet consists of smaller insects like ants, flies, mosquitoes, and moths. How do fall spiders get inside? They may wander in through an open door. Or squeeze in underneath a door that isn’t properly sealed. They may also hitch a ride inside in moving boxes. Door and window screens with holes are an open invitation as well. Where do they hide once they get inside? 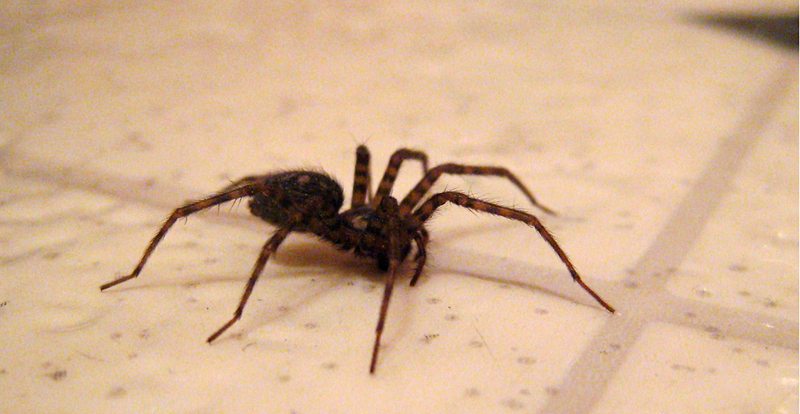 Spiders need lots of water, so they are often found in a dark corner, near a plumbing fixture. Keep your under-sink areas clean and clutter-free to discourage spiders from setting up camp. Cluttered storage areas are another favorite hiding place. A messy garage or attic can attract spiders, so a neat storage area will keep them at bay. Spiders love to hide in secretive, undisturbed spots. Other hiding places include under furniture and in stairwells, crawl spaces, closets, and basements. 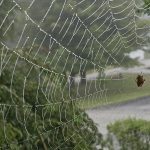 How can I prevent fall spiders from getting inside? Make sure your home is insect-free. Any indoor insects attract spiders. Keep your home’s exterior and outdoor structures clean and tidy. Trim landscape plantings so they do not touch your home. This prevents spiders from having easy access to windows and doors. Remove accumulated clutter in the garage, storage area, or basement. Use a vacuum attachment or a broom to remove cobwebs from walls, windows, and ceilings. How can I get rid of spiders that have found their way inside? Miss Muffet’s Revenge kills spiders fast – on contact. And keeps protecting for up to 12 months. This easy-to-use spray can be applied to surfaces where spiders frequent or hide. 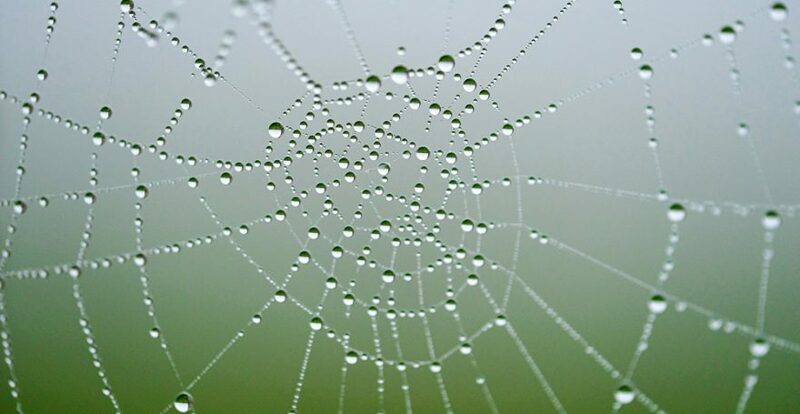 Spray a barrier around your home’s perimeter to keep eight-legged intruders away, or spray the spiders and areas with cobwebs, to rid your home of arachnids. Furthermore, Miss Muffet’s Revenge is designed for indoor and outdoor use and is perfect for attics, basements, windows, garages, crawl spaces and porch lights – any area where spiders take up residence. Spray a 12-inch band around the perimeter of your home. Spray until surfaces are slightly wet. Spray a 4-inch band at floor-level, around the room’s perimeter, or in areas with cobwebs. Spray surfaces until slightly wet. How does Miss Muffet’s Revenge work? Miss Muffet’s Revenge creates an invisible barrier that spiders can’t cross. If a fall spider comes in contact with the spray barrier or is sprayed directly – your arachnid problem is gone. What if it rains? Will I need to reapply Miss Muffet’s Revenge outdoors? Before applying Miss Muffet’s Revenge spider killer outdoors, it’s best to check the weather forecast. Spray outdoors when no rain is forecasted for the next 24 hours. If the area applied to is regularly exposed to the outdoor elements you may need to respray the area more often. For long-lasting residual control, leave the spray undisturbed. Where can I buy Miss Muffet’s Revenge spider killer? Visit our Store Finder to find Miss Muffet’s Revenge spider killer at a store near you. Or, click here to order Miss Muffet’s Revenge through our secure website. How do I attach the sprayer nozzle? Step 1 Remove the safety sticker and open the flip cap. Step 3 Grab the hose tip and gently pull it out. The hose inside the trigger sprayer extends to 3 feet. Step 6 Turn the spray nozzle to the OFF position and snap the sprayer into the bottle handle, after use. Lastly, store the container in an upright position to prevent product leakage from the breather hole. What do the different spray settings mean? 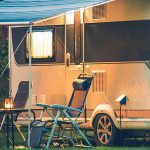 Setting 1 – Jet setting- best used for high elevations. This setting will reach up to 10 feet. Setting 2 – Fan setting- ideal for easily creating a wide ban around the exterior and interior perimeter of the home. Get rid of fall spiders fast with Miss Muffet’s Revenge spider killer. Can Moss on Your Roof Void Homeowners Insurance?